A sprained elbow is a type of injury affecting at least one ligament within the elbow. Each ligament is a strong band made up of tissue responsible for connecting bones together and forming joints. If a ligament becomes injured, it may be partially or completely torn or stretched. Any sprain affects the ligaments immediately around the joint, meaning that those experiencing an elbow sprain have torn or pulled at one or more ligaments within their elbow joint. Anytime that you hear a “pop” sound at the time of injury, inform your doctor as this may indicate a torn ligament. As long as they receive proper treatment, most people should completely recover from a sprained elbow within 3 or 6 weeks. To begin the process of diagnosing your sprained arm, your doctor will ask about how the injury occurred and your symptoms. He will then do a physical examination to check the severity of your injury and your joint stability. He may also conduct an x-ray to check whether any bones have broken and in rare cases, may recommend an MRI scan to determine if the ligament has completely torn, although MRIs are not frequently needed. Your doctor will diagnose your sprained elbow based on its severity, with three different grades each corresponding to a varying level of injury and slight differences in the ideal treatment. Grade I sprains involve some micro-tearing and stretching of the ligament tissue. Grade II injuries involve mild joint instability and partial tearing of the ligament tissue. Grade III sprains come with significant joint instability and complete or otherwise severe tearing of the ligament tissue. R - Resting the elbow. You should minimize the amount that you move your elbow and arm as a whole. I - Ice the elbow between 3 and 4 times each day. Each time, you should ice it for between 15 and 20 minutes. C - Compress the affected area using a compression wrap or elastic bandage around it. E - Elevate the elbow, lifting it higher than your heart. Try using pillows to help with this. There are also over-the-counter medications that can help with pain and swelling, including naproxen (Aleve or Naprosyn) and ibuprofen (Advil or Motrin). Acetaminophen (Tylenol) will reduce pain, but won’t help with swelling. If you have kidney disease, heart disease, or high blood pressure, or have had previous internal bleeding or stomach ulcers, always talk to your doctor before starting any of these medications. Be sure not to exceed the dosage on the bottle or given by your healthcare provider. Those with a sprained elbow might need to wear a sling, splint, or cast. A sling will prevent the elbow and arm from moving, while a splint or cast can help in the case of severe sprains. 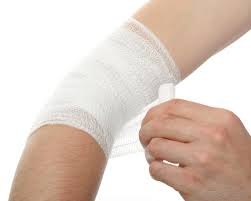 In some cases, you may need to use one of these items for 2 or 3 weeks, during which time your elbow will heal. Your doctor will recommend that you begin exercises at some point, each of which is designed to strengthen the elbow while increasing its range of motion and flexibility. Wait until talking with a physiotherapist or getting specific instructions from your doctor before starting any of these exercises. Most of the time, you should only perform the exercises if they aren’t increasing or causing pain. This is a flexion and extension exercise without any weight. Simply bend your wrist so it goes forward as far as you can before moving it backward as far as you can. Complete three sets, each of which has ten repetitions. To do this exercise, bend your elbow so it is at a 90 degree angle. Slowly begin to rotate your hand so your palm is facing upward and then downward. Do this in sets of ten repetitions, repeating three times. Take a broom handle and hold it in your hand so your palm faces downward. Slowly begin to bend your wrist upward before lowering the weight slowly down to your starting position. Complete 3 sets of 10 repetitions each. Try to gradually increase the amount of weight you are holding as you get better. As long as there is no dysfunction or instability and it is a minor sprain, it is rare to need surgery to treat a sprained elbow. If surgery is needed, your doctor will suggest. Elbow sprains will not be preventable in every case. You can, however, take a few simple steps to reduce the risk of developing one in the future. When playing sports, always use proper technique and wear protective equipment. Maintain strong arms and elbows through regular exercises. The strength will help absorb energy associated with any sudden physical stress. Never exercise if you are tired or in pain. Server responsed at: 04/22/2019 8:13 p.m.